I met Dean Stevenson many years ago when I was taking classes at Showcase School of Photography. He is the best photography teacher that I have ever had. I never missed the opportunity to improve my knowledge and skills with a camera when he was teaching class. Sometimes I would get on the waiting list to take his classes, but it was worth the wait. Over the years I ended up taking every class that he taught until there were no more left. I also had the opportunity to work with him professionally assisting him in a wedding shoot. I could see his work ethic up close. No detail was overlooked and the job was a success. 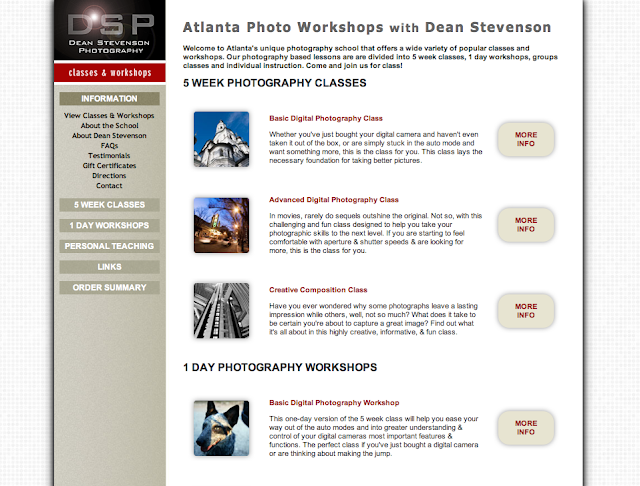 For years, Dean's dream has been to open his own school of photography in his own studio space, and now that dream is a reality as Atlanta Photo Workshops opens for business. Dean has designed several photography classes based on his experience teaching literally thousands of students. He has rewritten several of his core classes to be even better than before. Students have the choice of taking 5 week courses that involve weekly assignments, a fieldtrip and critiques. Or, they can take a intensive lecture-based class in one day. Students also have an opportunity to have personal tutoring with his one-on-one courses. Large groups and photo clubs can hire Dean for seminars.